Welcome to the Quiet Lakes! Welcome to the home page of the “Teal, Lost Land, and Ghost Lakes Improvement Association, Inc.” – popularly known as the Quiet Lakes Improvement Association (QLIA). Since 2017, this website has been our chosen medium for disseminating knowledge and encouraging practices that will conserve our quality of life on Teal, Lost Land, and Ghost lakes. As President of QLIA since July of 2017, it is my privilege to serve almost 200 memberships (individuals, families, and business owners) who live near and care about these waters in the heart of the Chequamegon National Forest. 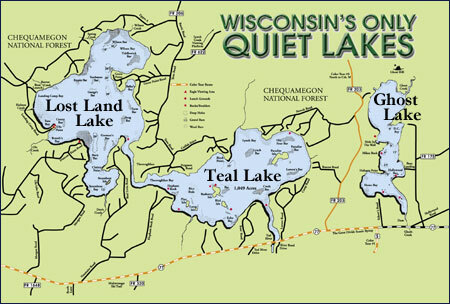 We are proud to partner with the Quiet Lakes Tourism Association (QLTA) – a group of area businesses (mostly resorts) who created the map below to help promote their visitor services at www.quietlakes.com. The “Quiet Lakes” are special by any measure. As a retired supervisor of fishery management for the Wisconsin Department of Natural Resources, I became familiar with literally hundreds of lakes in northwestern Wisconsin. In my opinion, the Quiet Lakes combination of wild northwoods scenery, interesting and diverse habitats, abundant wildlife, enviable water quality, a thriving fishery, and the moderate pace of quiet, respectful human activity is unmatched among other developed lakes in Wisconsin. We are fortunate indeed to be part of a balanced ecosystem that exemplifies how humans can live in harmony with wild places and neighbors. But we must act wisely to preserve and enhance these natural resources for future generations. We must practice conservation. Though not a true “wilderness” experience, time spent on any of the Quiet Lakes is likely to instill a sense of tranquility in those who seek to relax and reconnect in a wild setting devoid of high speed and loud noise. Many QLIA members chose to retire on the Quiet Lakes; and they paid a premium for their lakeshore property in expectation of living a slower, quieter pace of life that demonstrates respect and appreciation for like-minded neighbors – human and non-human alike. With this website, we seek to provide friendly “one-stop shopping” for any and all information about our lakes that may be important to members and supporters of QLIA. This will also be our primary means of soliciting volunteers or raising money when new projects demand significant time or dollars. Because each page and post provides an opportunity for readers to REPLY, we will appreciate and seriously consider member feedback as we seek to address and act on the most pressing concerns of the day. All reader input is moderated and may be edited or rejected prior to posting if the content grossly distorts facts or lacks basic civility. There will be no fake news or hate speech posted here. Parents will find this site to be fact-based and safe for their children’s viewing. Our Water Quality page contains sub-pages on our volunteer water quality monitoring program, wastewater management (private septic systems), and drinking water testing procedures (private wells). New and existing lakeshore landowners will find all the information they need to ensure their private water systems are safe for family, pets, and all who enjoy recreating on our lakes. Our Aquatic Plants page provides access to the comprehensive Aquatic Plant Management Plan completed by QLIA in May of 2017. Other sub-pages describe the recent invasion of Hybrid Eurasian Water Milfoil (HEWM) in Lost Land Lake, along with previously ineffective attempts to control it with herbicide and ongoing efforts to control it mechanically with the 2019 purchase of an Eco-Harvester aquatic plant puller. This will be a high priority for QLIA in upcoming years. Our Fisheries page provides access to the comprehensive Fishery Management Plan completed by Wisconsin DNR’s Sawyer County Fishery Biologist Max Wolter in November of 2018. Sub-pages provide detailed information on fishing regulations (including voluntary release and selective harvest recommendations), fish stocking (including efforts cost-shared by QLIA), fish habitat (including QLIA plans to enhance near-shore woody cover), tribal spearfishing (minimal activity and impact), and the results of recent fishery surveys conducted by the Wisconsin DNR, often with help from QLIA volunteers. Anglers will find a wealth of information that will make their fishing more interesting and successful. Our Wildlife page is in very early stages of development. Members and friends are encouraged to provide photos and stories deemed worthy of posting. Near-wilderness habitat and expansion of the recently restored Clam Lake elk herd into the Quiet Lakes region makes this a particularly interesting area for wildlife viewing. Our Membership page provides all the information and downloadable forms needed for new members to join and existing members to renew annually, along with a list of all new members (usually couples in joint membership) who have joined QLIA since our Annual Meeting in July of 2017. Our $20 annual dues have not increased in many years; and the QLIA Executive Committee expects no change in the immediate future. In the wake of a successful Eco-Harvester fund-raiser ($82,505) in fall of 2018, we are finding that our generous members are prepared to meet any fiscal challenge on an as-needed basis, allowing us to keep regular membership dues at a level even our most frugal neighbors can afford. The QLIA Executive Committee believes in transparency and good governance, and therefore we have created a Meeting Minutes page where the official records of our annual General Membership meetings and periodic EXCOM meetings are posted. EXCOM meeting minutes are posted shortly after approval at the following EXCOM meeting. General Membership meeting minutes are posted provisionally several months in advance of the upcoming annual meeting in order to give members a reasonable chance to review and suggest changes before a motion for approval is entertained at that meeting. If approved, they are posted in final form shortly thereafter. Finally, we have begun to develop a History and Archives page that contains our 50-year history (1947 – 1997) by Past-President Charlie Baumann, seasonal ice cover records, and interesting news articles from our past. Members are encouraged to submit old clips and photos that may be of interest to all. Please e-mail all submissions to me at dneuswanger@gmail.com. Contact information for all EXCOM members can be found on the About Us page, along with links to other volunteer organizations or government agencies with whom we partner. Breaking news and upcoming events are posted for a brief time in the Latest News slider and Events field in the right sidebar of all pages. As these stories and notifications become “old news,” they are moved to appropriate subject pages for longer-term reference. We aim to keep all information on this site relevant and up-to-date. Fishery Management Plan Completed for Teal and Lost Land Lakes! 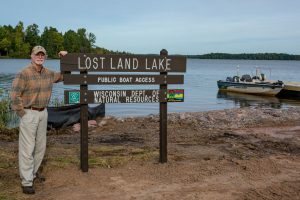 09/28/18 Update: DNR boat landing at Lost Land Lake NOW OPEN for public use!